What if you could listen to 21 experts who would share tips to improve your life post cancer. Starting February 15, you can for FREE. Sign up now. This information could significantly improve the quality of your life. 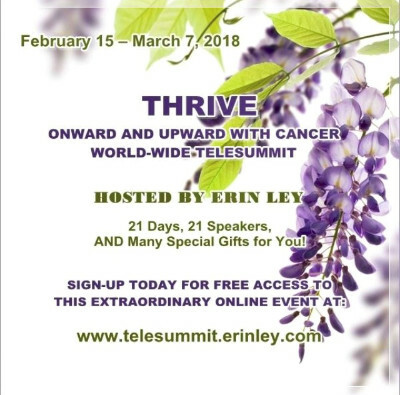 Join 21 experts in health and cancer and listen to Erin Ley’s Thrive Onward and Upward with Cancer Symposium. I am honored to be a speaker in this series. After I finished writing It Feels Good to Feel Good, I have been speaking to groups about the dangers of toxins that are everywhere in our daily lives. My mission is to help others take control of their health and make the changes that can significantly improve their quality of life. Although I wrote the book for people with inflammation and autoimmune disease, I now understand that inflammation is one of the key root causes of many of our chronic diseases, cancer, strokes, heart disease, Parkinson’s, Alzheimer’s, diabetes (both type I and type II) even depression is impacted by inflammation. I lost a dear friend to cancer. My husband lost his first wife of 43 years to cancer. I want to help others who are cancer survivors live a healthier life post cancer. I have spoken to cancer groups because not only have cancer survivors been attacked by the disease, but then also by the treatment. They can not afford to be attacked by the toxins in their lives. They need direction to help them “clean up“. I want to share my information to help them do just that. Erin Ley, our host of this symposium, is a cancer survivor. She has also lost close loved ones to cancer. Her mission is to help other cancer survivors with tips to boost their quality of life Post Diagnosis, and she has put together an amazing online event with 21 caring health professionals with a passion to share their tips with you to live a long life and thrive. When someone is confronted with a cancer diagnosis, it usually evokes fear, anxiety, confusion, anger, remorse, and resentment. However, it also evokes immediate appreciation for life far greater than ever before. Things get put into perspective. It’s an opportunity for growth and allows the patient to soar to new heights on many levels. Increasing the quality of life and peace of mind for cancer patients is what this online event is all about. We share extraordinary insight, powerful examples, ground-breaking cutting-edge information, and collaborative advise you couldn’t put a price on that WILL change your life. There are 21 experts participating in this world-wide event who are not only offering their personal stories and expertise, they are also offering FREE gifts to help you on your endeavor to live a more fulfilling life, a life filled with quality and peace. This summit goes live February 15 and runs for 21 days. Right now is such a crucial time to set the direction for your life. Join us as we empower you to take another step onward, with greater peace of mind, toward the dreams and goals you’ve set for your present and future. Join me, Erin, and 20 other experts, so we can support you in doing just that—the leap into a life of countless options, greater quality of life, and peace of mind. If you are a cancer survivor, or have loved ones that are cancer survivors, friends, family, co-workers, please share the information about this conference with them. The insights and tips by this group of experts can make a big difference in their lives.